Toboganning in synonymous with Switzerland. Swiss ski resorts have been leading the way with their exhilaratingly long, toboggan only pistes for years. 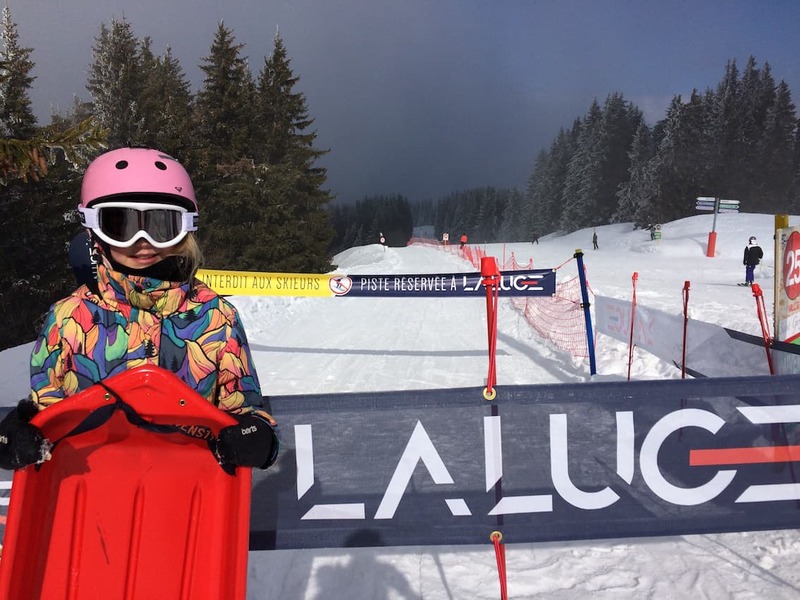 France now have cottoned on to the fun factor of seriously long luging with Mégève being the latest ski resort in the Alps to add a luge only piste to their Winter sports arsenal. The new luge in Mégève is a dedicated 3 kilometre sledging piste. It’s a fast, frenzied and often a chaotic descent, but a great way to spend a Winter morning or afternoon with the kids. 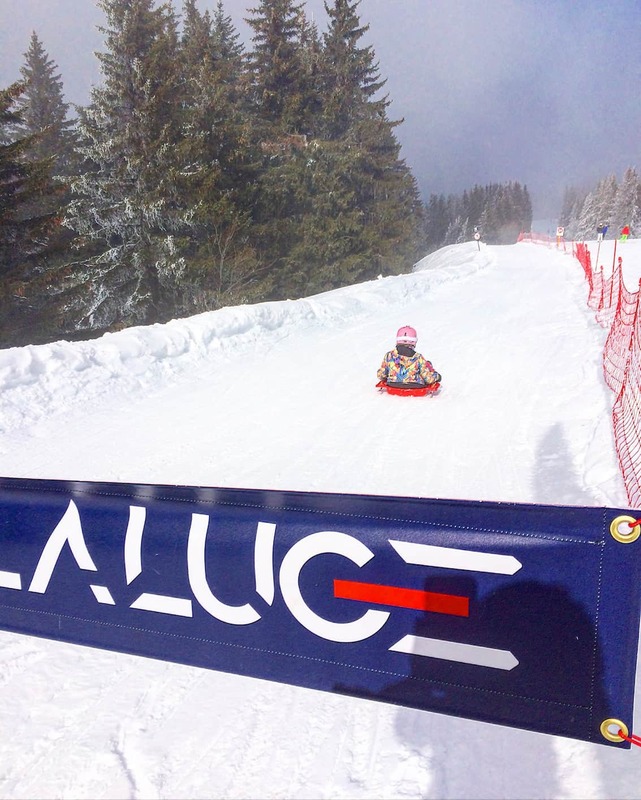 Read on to find out everything you need to know before heading to the luge in Mégève. Watch us below toboggan the La Luge in Mégève! La Luge, Mégève – what is it? The new Mégève toboggan run is a whopping 3 kilometres long and take arounds 20-30 minutes to sledge from top to bottom. 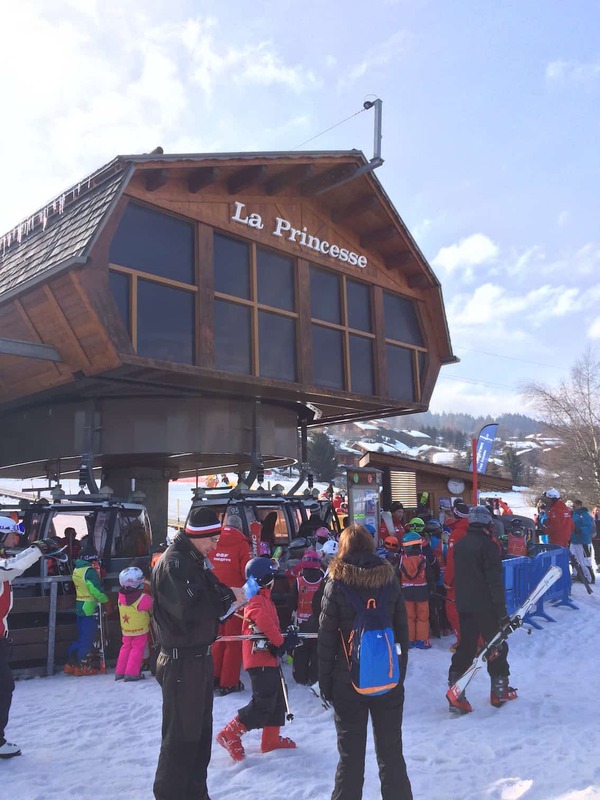 Access the La Luge in Mégève by parking at the ‘La Princess parking’ (see details of how to find this below). This piste du luge (similar to the ones at Val Thorens, La Plagne and Tignes) starts from the top of Mont d’Arbois (1840m) where it runs parallel with a skier’s piste initially before descending in a series of hairpin bends through the forest, ending at the mid way station of the Princesse lift. You can buy tickets from the cash desk at the bottom of La Princesse cable car for €7 each. You’ll need to access the Princesse cable car to both the mid station where you’ll pick up your sledges and on again to Mont d’Arbois to access the start point of the luge run. After buying your luge passes, catch the La Princesse cable car up to the first stop, the mid-station. You’ll need to get out here and look for the La Luge banners & sledge depot. Here you’ll pick up your sledges and helmets (if you don’t have your own) and listen to the rules being explained before setting off again up the second half of the cable car to the top of Mont d’Arbois to the the top of the unmanned piste du luge. Don’t make our mistake of looking at the piste map, seeing the top of the luge run starts at Mont d’Arbois and taking the cable car all the way up! The start of the luge run is unmanned and there are no sledges there! We had to take the cable car back down to the mid way station to pick up our sledges and then catch the cable car back up to the top of the luge run!! When you come out at the top of the La Princesse cable car, swing a left and you’ll see the La Luge banners indicating the start of the run. The luge piste is unmanned so don’t expect to see any staff there. It’s a case of reading the rules again and strapping in. The weather began to close in a bit whilst we were there, but because the run is through the pine forests, visibility was still good so don’t be put off by a bit of bad weather – it’s still worth it! 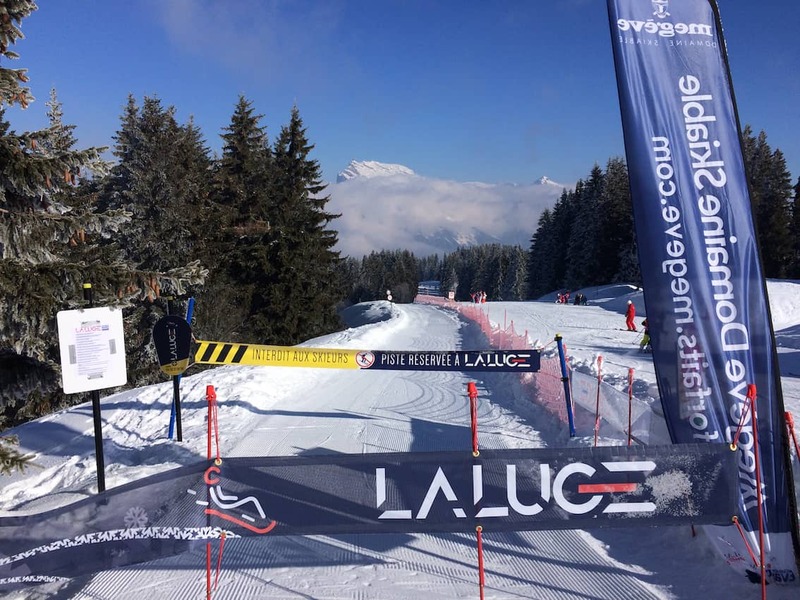 The start of the La Luge piste at the top of Mont d’Arbois is unmanned. Strap in and off you go! Each sledge has a leg strap which you need to secure before setting off. 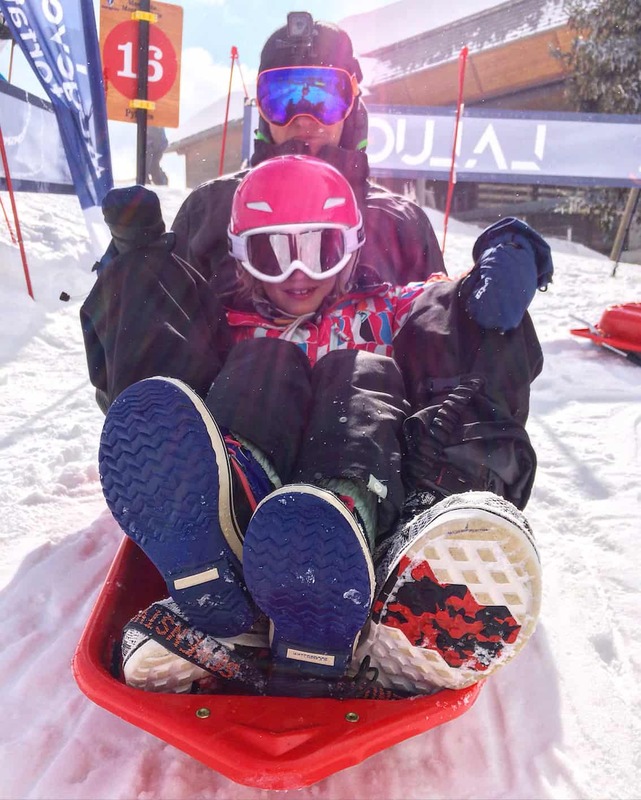 It can be a squeeze to get under 10’s in the same sledge as a parent. 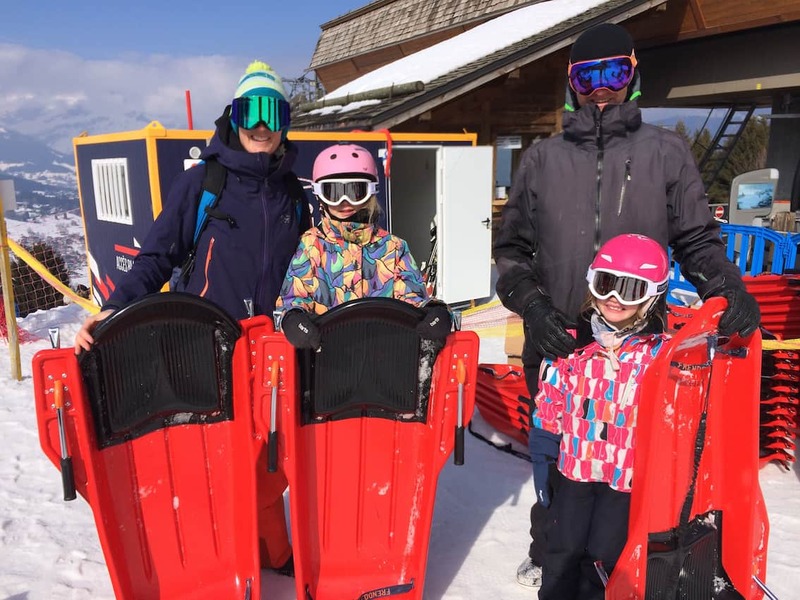 It would be good if there were two size sledges, one for solo riders and a larger twin seater for kids and parents and hopefully this is something they’ll consider after this first season’s feedback. The beginning of the luge piste is a long straight section running parallel with a skiing piste. This gives you the time to try out your sledge controls before the descent kicks in. Expect to have a few crashes here! Me and my oldest found the controls difficult to master and only really got the hang of them half way down the run!! Setting off. The straight section at the beginning allows you to try out your sledge controls before the descent! Once the gradient gets steeper you’ll pick up speed and start to head down into the trees away from the pistes and skiers. It’s a truly beautiful ride down but trust me you’ll be concentrating more on your controls and not crashing than taking in the beautiful scenery! Of course Mr Family Freestylers was able to master his controls almost immediately and proceeded to hoon it down the piste taking the corners at speed, flying through the transitions and up the banks. My 9 year old and myself encountered lots of crashes with absolutely no-one (!) as we swerved uncontrollably up the banks due to our heavy handed steering! Finally half way down it seemed to click and we began to enjoy this adrenaline fuelled descent! Can I take my own slege to do the La Luge run at Mégève? You cannot take your own luge/sledge to do this toboggan run, like in some other luge runs in Switzerland. You can only use the luges that they provide. Helmets are mandatory. If you don’t have your own, they will provide you with one free of charge. 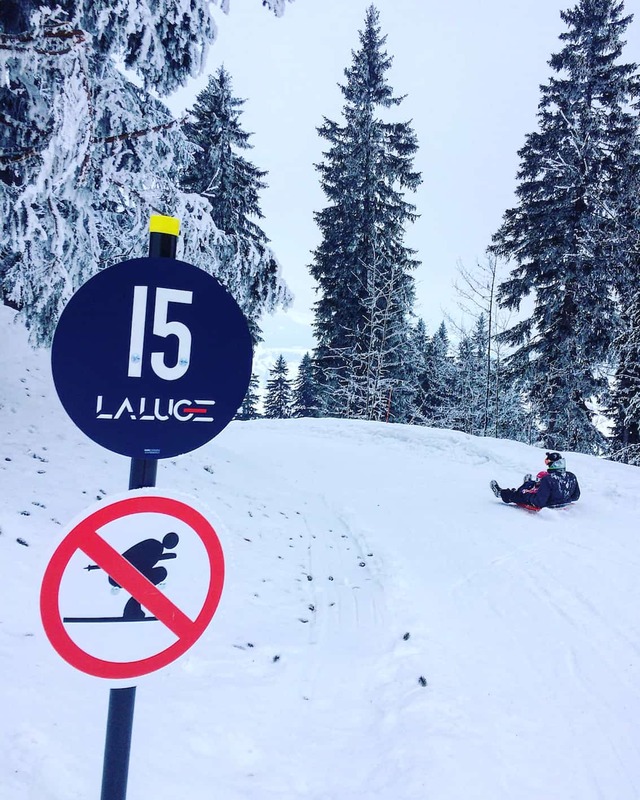 What are the age restrictions for La Luge, Mégève? The minimum age is 5 years old. 5-10 year olds must be accompanied by an adult, although all the luges are the same size so even with our 7 year old it was a tight squeeze to have her in with one of us. We actually told a white lie and said our 9 and a half year old was 10 – she was way too big to fit in with one of us. The course is pretty gnarly and everyone we saw on the way down was definitely out of control, so the age limit is well deserved! Can I access the luge from the top of the Mont d’Arbois if I’m skiing? No. Don’t make the mistake of thinking you can get on the luge at the top of Mont d’Arbois. The start of the luge run is unmanned so if you’ve come up another cable car i.e. from Mont d’Arbois cable car and are skiing the area for the day, you can’t just rock up at the top of the luge to do it. A – there’s nowhere to leave your ski kit and B/ there are no sledges here. You have to go down the La Princesse cable car to the mid station to pick up your sledge and then come back up. You could chance it and leave your skis outside Cafe Woody which is next to the La Luge sledge collection point, do the luge and then pick up your skis but there’s no dedicated, safe place to leave skis while you’re doing the luge run. How much is the La Luge at Mégève? The tariff is €7 per person which includes the equipment (sledge and helmet). 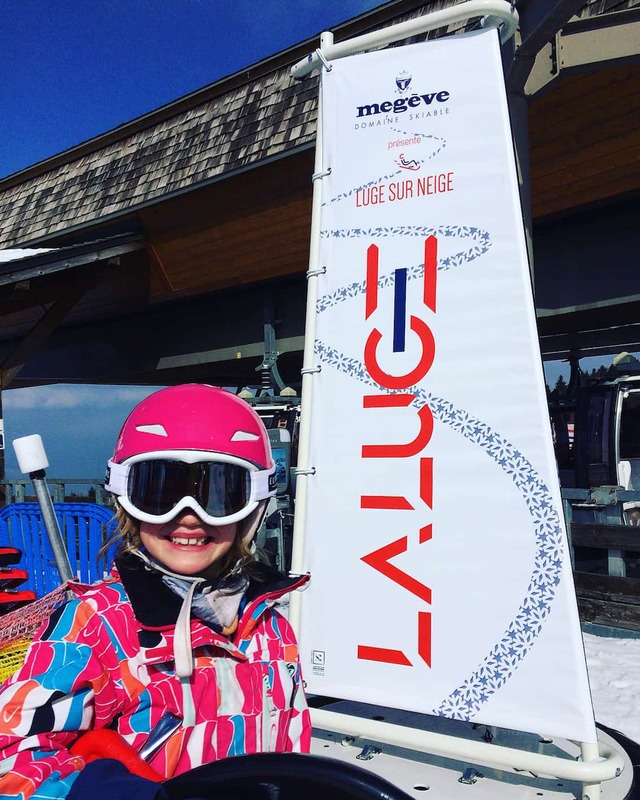 Most of the ski passes for Mégève also include one free luge descent so definitely ask when booking your ski pass and make sure you take advantage of it. How do I get to the La Princesse Cable Car? The Princess cable car departs from Demi Quarter, a village 2km before Mégève travelling from St Gervais to Mégève. The signs aren’t very clear and we actually sailed past this and into the centre of Mégève before having to ask someone and being re-directed. Parking is free at La Princesse cable car and there are toilets and ski rental shops at the bottom of the lift. The Megève ski area belongs is a large ski domain called Evasion Mont-Blanc. This area connects the villages of Combloux, Giettaz, Saint-Gervais, Saint Nicolas de Véroce and Les Contamines totalling 445 km of pistes between 1113 and 2350 m high. It must be quite fun for the kids to sledge for 20-30 minutes from top to bottom.. I used to go” toboganning” in the Carpathian Mountains when I was younger. I remember it was a lot of fun, but I don’t think I would enjoy it any longer. This seems like a lot of fun and terrifying at the same time!! I think I would be terrified at the speed of this. Was it scary? The pricing seems very affordable, especially for a family. Oh WOW! On one hand this looks like so much fun, on the other there are some huge drop offs and some spots that looked like there wasn’t much of a safety bank, Scary! Such fun. I did a night sledding adventure near Interlaken. So exciting but we needed more snow. This looks like an easier run. Sounds so much fun swerving down the slope! I guess one has to follow the age rules here. Looks a bit precarious to me. That is so much FUN! In Canada, we have plenty of snow too but there’s no place where we can go tobogganing for 3 km! This looks like a great destination for adults and kids! The video gave the gist of the whole thing and it is truly soooo much fun! Can imagine the adrenaline rush during the descent:) WOW. Crazy fun! Snow + hairpin bends +pine forests sounds like a deadly combo 🙂 Thanks for explaining all about it. I had no clue about the luge run! Beautifully put together answering all the possible first timer questions! Wow! What a fun ride! And seriously, it is only 7 euros for a ride that lasts 20-30 minutes long? That’s a great price! I’ve never been Toboganning! I don’t come from a place where it snows. This looks like so much fun! And the price isn’t bad either! This is a great idea for a family trip one day!